I remember visiting the wet market frequently with my mum when I was a kid. We would get the fresh produce that we need and then head to the food centre for breakfast - typically consisting of chwee kueh, hor fun, chai tow kueh, and a cup of kopi for my mum and hot Milo for myself. Afterwards, we would cycle back home where I would get ready for school. The incessant chattering among housewives, the sound of fishmongers chopping away on their chopping boards, the rattling of trolley wheels, the beckoning of vegetable stall vendors, the pungent smell of Asian spices, the splashing of water over stalls and drains to clean up, the small talk my mum would exchange with the vendors, the way she knew where she could and how much to bargain, the feeling of a community spirit - these are the things that remain vivid in my mind even up till today. Fast forward to two decades later, I gave birth to my first kid in Karlskrona, a small town in Sweden where you get your groceries from supermarkets and hypermarkets. Did you know? For all those years, we had to be contented with frozen, not fresh fishballs, tau poks, pigs' intestine, roti prata, lotus roots, duck, steamed buns and durians. Yes, you'll be amazed by all the things that come frozen. And even if we wish to get these frozen Asian food supplies or fresh ones like toufu and vegetables, we either had to wait for the bus that comes to our town on alternate weekends or drive two hours to the next town. It's only after having stayed abroad that we realised how easy it is to take things from granted when living in Singapore, including the ubiquitous markets and readily available fresh food. Anyway, there was no way I could replicate those memories of visiting a traditional market with my girl during those years. Then, we returned to Singapore when she was three and I was heavily pregnant with the second child. You could say that at that point, I was the one reluctant to venture back into the wet market with a toddler and a big tummy, even though I knew that by hook or by crook, I had to ensure that our meals were served. Ironically, it was the husband, who by the way is a great chef but only cooks once in a blue moon since we got back, who first ventured into and explored the wet market closest to us - Sengkang New Market. He couldn't stop raving about how fresh the seafood was, how friendly the vendors were, how cheap everything was as compared to the supermarket and how convenient it was to get fresh fish and chicken nicely cleaned and chopped up instead of us having to do it at home. It was his encouragement that finally made me snap out of procrastination and mustered enough courage to bring two small kids to the market with me. The thing about markets is that in order to get the freshest stuff, you have to go as early as possible. So we would try to hop over as soon as we can, but that is usually after the kids already have their breakfast. And boy oh boy, even though we assume it is considered a late timing for most market-goers, the crowd is still there! With a stroller, diaper bag and the kids in tow, I have to say it does take a bit of practice to get used to the whole bustling scene. Unlike what I remember from my childhood, many of the markets I see nowadays are not as 'wet' as they used to be. In fact, in Sengkang New Market, the floor is not only dry but relatively clean as well. While that might diminish the uniqueness of these traditional markets, at least it makes me feel glad to know that my kids will not slip and fall easily as we make our rounds. Today, the market has become one of the places that we go to on a regular basis to stock up on fresh food supplies and in this post, I'm sharing with you some of the stalls that we frequent. Our first stop is usually the Vegetable stall where you can get three juicy tomatoes for $0.50 and two bundles of spinach for a dollar. The vendors are usually two middle-aged men who are very efficient when it comes to handling customers and are prompt to take over your veggies to help you weigh them and work out the total cost. By the way, is it just me or do you agree that many of these market vendors seem to possess a mental calculator and can do addition faster than we can type it in? Next is my favourite stall of all - the Chicken stall. Ok, you can get duck here too but it sells mainly chicken. You can either get it in whole (including normal, kampong, spring and black) or in individual parts. From feet, legs, winglets to bones and breasts (they even differentiate between a big breast and normal one), depending on what you are cooking for the day, it's easy to get what you need. The lady vendor here is extremely friendly and sometimes on seeing the kids and hearing that I'm making soup for them, she would throw in some additional bones just for us. She also helps you to debone, deskin or cut the whole chicken into chunks depending on whether you wish to fry, stew, braise or cook soup etc. You know, I've been so used to cleaning and chopping up a whole chicken on my own in Sweden (it's more for economical reasons and just so you know, a whole chicken usually costs less than a piece of chicken breast over there) so this was definitely a welcome change. Then we move on to the stall right opposite which is the Fish stall. 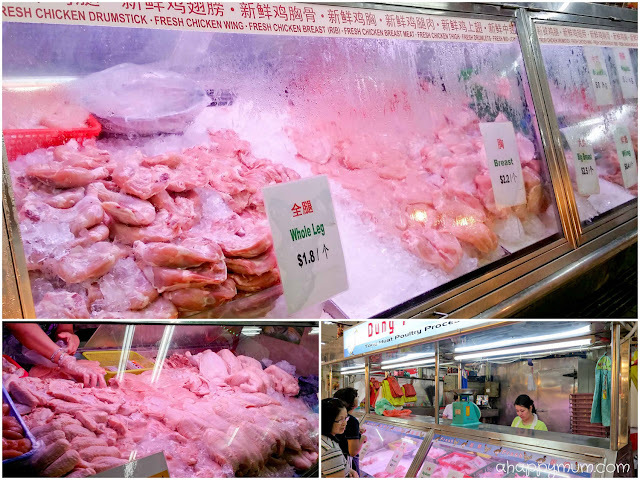 This is probably the hubby's favourite stall as he is a seafood fan so the fresh prawns, squids and cuttlefish will thrill him. For me, I get our supply of fish here as I find that they are usually fresher than the ones we see in the supermarket. We usually go for cod, promfret, seabass or red grouper. I remember seeing my mum checking for the freshness of the fish through 1) Firm, bouncy flesh, 2) Bright, clear eyes and 3) Healthy, red gills. At the beginning, I was a little hesitant about choosing my own fish and would get the vendor, who is a young chap, to pick for me. Over time, I became a little braver and decided it would be easier to pick the fish myself as I know what type and size would work best for us. The only problem I have is trying to prevent the toddler from wanting to play with the pail of water meant for customers to rinse their hands. There is also the Provision Shop that basically sells dried food, including alliums like garlic, shallot and onions, potatoes, chilli, eggs, spices, mushrooms, rice vermicelli, marinate powder, sauces, condiments and canned food. You can also pick up a cold drink here when the weather gets really hot. The Yong Tau Foo stall is also well-liked by us. You can get fishballs here that are not only big and fresh but also less salty than the ones sold in the supermarket. On days when I am feeling a little lazy, I would just cook stock using soybeans and ikan bilis, and we would have yong yau foo for lunch or dinner. The kids love noodle soup cooked in this way and will be extra delighted if they spot the special fishcakes (shaped in Doraemon, Angry Birds or cute animals) in their bowls. I remember how cheap it was to buy spare ribs in Sweden as the people were not as fond as using them to make soup as we do. You can get a big packet for just $2 so when I came back and realised I had to pay near $5 for a small packet, it was quite a shocker. Nonetheless, we are the kind of family that practically needs soup for every meal so I still frequent the Pork stall to get some bones or spare ribs. You can also get pork belly, pork loin, pig's trotters or minced meat depending on whether you are making char siew, roasted pork or braised trotters. I usually prefer to make my own minced meat because I somehow get the impression that minced meat from stalls are made of the less healthy, unwanted parts. Our last stop will be the Fruit stall which sells a variety of fresh fruits. Just look at the durians! It's just too bad that this king of fruits somehow makes me nauseous since I was a kid and I've never liked it from then on. Nonetheless, I try to ensure that we have an intake of fruits everyday. Angel's favourite fruit is the red dragon fruit, Ariel loves mango while I like guava with a generous serving of plum powder. We also eat apples, honeydews, kiwis, pineapples, watermelons, grapes, peaches, nectarines, cherries, jambus, longans, lychees and more (I don't like my kids to be fussy, you too right?). If we are in a rush or just wish to have a small serving, we would get the ready packed ones which sell at three packets for $5. If not, I prefer to buy fresh whole fruits home and cut it up ourselves. 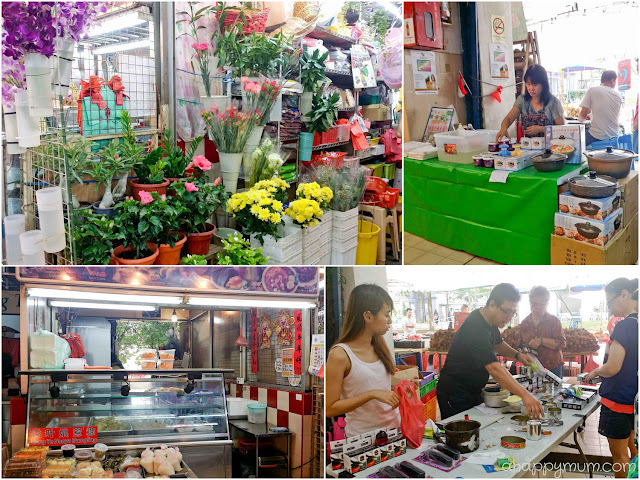 There are also the little stalls, like the florist and nonya dumpling stall, that easily get overlooked yet their regular customers remain loyal and often come back to show their support. We also see people setting up temporary stalls to sell random items like woks, pots, knives and other kitchen appliances. Sometimes I wish I had the time to stop and listen to the way they boast and sell their products but that is not very feasible with kids who are lively and have limited attention span. Still, it makes me chuckle to hear some of the things they say and some lines that left an impression in me are "人山人海, 却没人来买", "这把刀从 City Square 切到 Marina Square 都没问题", "保证你的罐头开得比刘德华更"滑"!" So I guess visiting the market with kids is not such a scary experience after all. It allows them to learn about this fast disappearing tradition and and cultural experience in Asia; makes them realise that money is hard earned; lets them make friends with the friendly aunties and uncles; teaches them that our meals don't just appear out of nowhere onto the dining table and reminds them to never forget our roots in this rapidly evolving, modernised society. It's also a good way for them to learn to read labels and pick up some new words. I like to let them pay for the things we purchase so that they not only practice their math, they also realise that everything costs money. We also get this priceless sense of achievement when we return home with a stroller full of fresh food and groceries. Yes, I guess I've now replicated those fond memories to a certain extent and I'm just hoping that my kids will one day be able to do this with their children, grandchildren and then great-grandchildren. This is part of the ‘To Market, To Market’ Blog Train blog train hosted by Life's Tiny Miracles. Join us as we visit markets around Singapore with fellow family bloggers and see if any of these evoke your memories! Next up is Pamela from the Tan Family Chronicles. 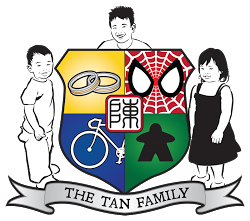 Also known as Mrs Tan of the Tan Family at Throwback: Balik Kampong, Pamela enjoys blogging about her family and their experiences. Hihi! Thanks for inviting me to be part of this interesting blog train! It's not the only market we have in Sengkang, in fact, I think it's one the smaller ones but it suffices to meet our everyday needs! =) Thanks much for reading! Lol yeah I enjoy hearing them and all the creative taglines they come up with! =) Yours is Tiong Bahru, much more popular than this small market! But yes, I am relieved to find $1.80 chicken breasts here! Haha. The modern wet markets are no longer wet haha, and my kids could not resist playing with the pail of water at fish stalls too! I find that the best thing about shopping in the wet markets is that you get to buy the quantity that you need and S always charms the veggie aunties into throwing in something extra :) A pity we don't go frequently so it's still the supermarkets for us.